Metabolism is a complex process that CELLOMET can help you understand. A metabolic map can be compared to a metro plan and CELLOMET can decipher this map. 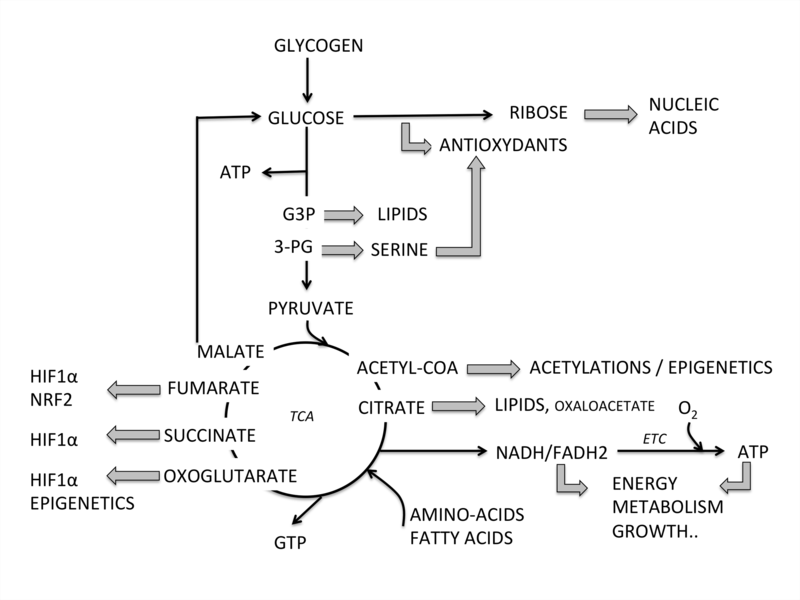 Energy metabolism is the process of generating energy (ATP) from nutrients such as carohydrates, fat or proteins, through a series of interconnected biochemical pathways. Those processes can be altered in a large number of genetic diseases or as a consequence of toxic insults. Therefore, in addition to the approximately 200 rare diseases with an alteration of energy metabolism (Koopman WJ, Willems PH, Smeitink JA. Monogenic mitochondrial disorders. N Engl J Med 2012;366(12):1132–41), a huge number of individuals suffering from chronic illnesses and age-related diseases also present various aspects of bioenergetic alterations and could benefit from adapted bioenergetic modulation therapy (BIOMET). For instance, dysfunction and deregulation of numerous mitochondrial and cellular bioenergetic pathways (glycolysis, Krebs cycle, β-oxidation, amino-acid-degradation, energy sensing..) were reported in type 2 diabetes and chronic kidney diseases (CKD), metabolic syndrome, acute coronary syndrome (ACS), common neurodegenerative diseases such as Alzheimer’s, Huntington’s and Parkinson’s diseases, autoimmune disorders, age-related macular degeneration, optical atrophies, bipolar disorder, infertility, fatigue and several types of human cancer. in situ regulation of mitochondrial heterogeneity by the cellular and the mitochondrial microenvironment. Therefore, mitochondrial physiology research is central to the study of energy metabolism, and the modulation of mitochondrial function is also a strategy of choice to restore energy metabolism homeostasis in a large array of diseases. 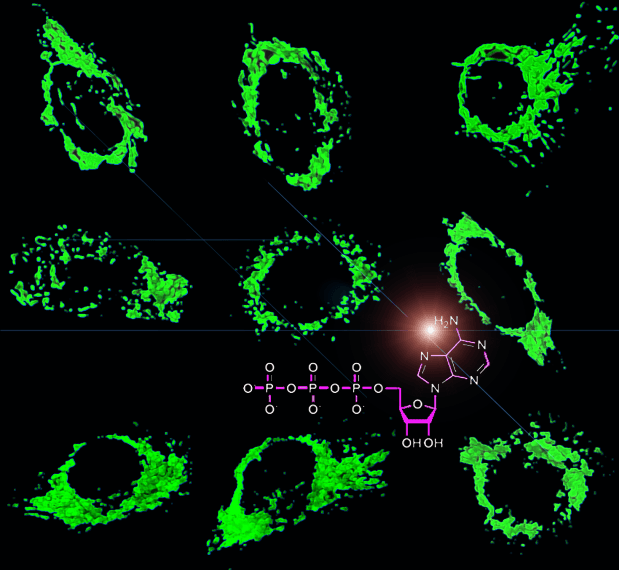 Several inhibitors of the respiratory chain have been discovered so far, and used in a broad range of applications such as insecticide, piscicide, and pesticide. However, only few activators have been discovered and few compounds are active on the mitochondrial membrane, organelle biogenesis and the F1F0-ATPsynthase activity. Mitochondrial biology includes a large number of specific features, as heteroplasmy, organelle dynamics, and the existence of a biochemical threshold effect which must be considered for the investigation of energy metabolism alterations and for the development of mitochondrial drugs. 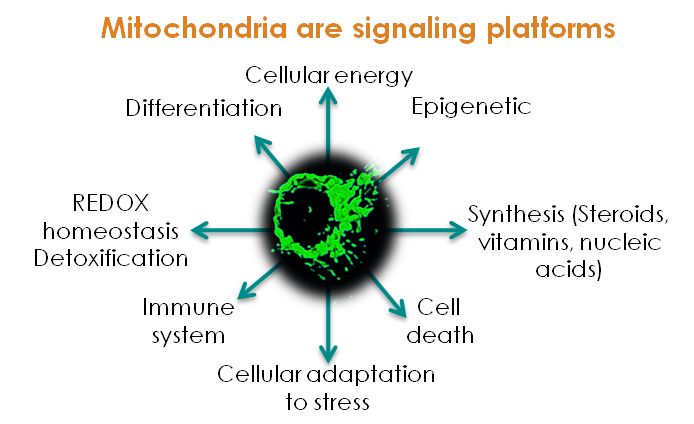 In addition to their biological function as the cell powerhouse, mitochondria are now also considered as signaling platforms that control pathways involved in cell fate (the intrinsic pathway of apoptosis) and the immune response to pathogens and cell stress. These highly dynamic organelles host numerous innate immune signaling regulators, of which some are directly linked to the OXPHOS capacity and its control of oxidative stress. Therefore, mitochondrial bioenergetics is tightly connected to innate immunity and the extent of the immune response (Lartigue L, Faustin B; Int J Biochem Cell Biol. 2013 Sep;45(9):2052-6). Importantly, mitochondrial oxidative metabolism in T cells is instrumental to acquire their adaptive effector immune functions. Therefore, they emerge as promising therapeutic targets to improve T-cell mediated antitumor immune response, impair inflammation, or inhibit autoimmune processes (Anaplerotic metabolism of alloreactive T cells provides a metabolic approach to treat graft-versus-host disease. J Pharmacol Exp Ther. 2014 Nov;351(2):298-307). The biochemical pathways involved in cellular energy transduction can undergo profound reorganization in response to various metabolic stresses associated with changes in human physiology (eg. during embryogenesis or exercise training) but also in situation of diseases. This rewiring of the biochemical pathways along with the rerouting of several metabolites allows the organism to cope with high fat and high sugar intake in the metabolic syndrome. In cancer cells, metabolic flexibility allows tumors to grow despite the lack of oxygen or glucose, by switching from one energy substrate to another. Metabolic remodeling involves nodal enzymes (as PDH regulated by PDK1 under the control of HIF1alpha) but also transcription factors and kinases (such as AMPK). Metabolic remodeling constitutes a target of choice to modulate energy metabolism and advances in the field demonstrate that energy transduction processes are tightly linked with epigenetic control, amino-acid and lipid biosyntheses, antioxydant production or cellular adhesion and migration processes (Emerging concepts in bioenergetics and cancer research: Metabolic flexibility, coupling, symbiosis, switch, oxidative tumors, metabolic remodeling, signaling and bioenergetic therapy. Obre E, Rossignol R. Int J Biochem Cell Biol. 2015 Feb;59C:167-181.). Therefore, large-scale methods are required to characterize the extent of metabolic remodeling in the cell, and multi-parameter analyses must be proposed to describe a pathologic condition or the mechanism of action of a metabolic drug. Importantly, the metabolic remodeling enables tumorigenesis and immune functions in tissue-based environmental constraints such as nutrient deprivation and lack of oxygen. The regulation of energy metabolism is multisite and the potential sites for bioenergetic modulation therapy (BIOMET) with health benefits could be numerous. Some therapeutic strategies aiming at the stimulation of energy metabolism were already tested at the preclinical stage, either through pharmacology or genetic means, and clinical trials are ongoing for some drug candidates. Some BIOMET drugs already approved or in development are indicated in blue in the figure shown on the right. 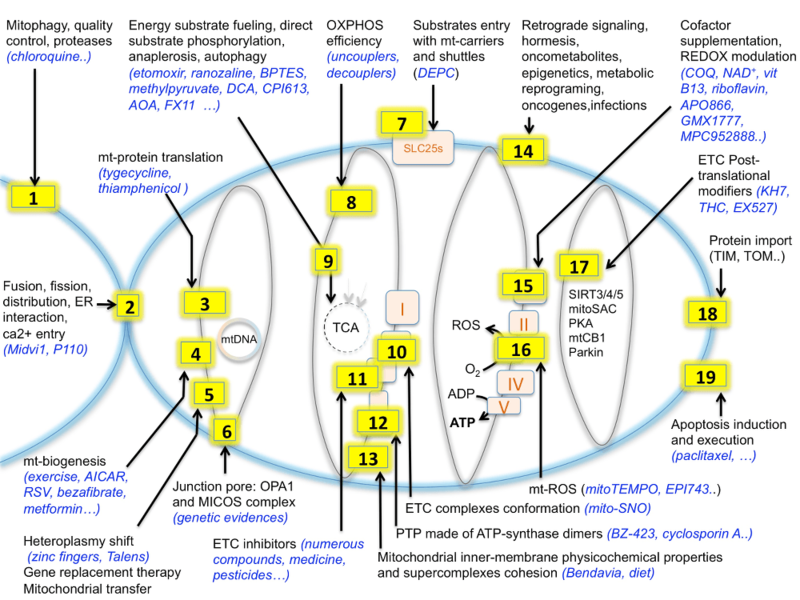 Nineteen intervention sites for BIOMET are illustrated on the mitochondrion, although other possibilities exist at the level of plasma membrane or other cellular organelles (not depicted here but summarized in N°14). oenergetic modulation can be obtained by intervention on mitochondrial turnover including organelle biogenesis and degradation (N°1,4), mitochondrial DNA (N°5), mitochondrial overall and internal structure (N°2,6), respiratory chain activity and organization (N°10,11,17,15), mitochondrial protein import and translation (N°3,18), energy substrate delivery (N°9,7), mitochondrial membrane composition and properties (N°13,8), energy sensing, nutrient sensing and retrograde signaling (N°14) and mitochondrial cell death execution pathways (N°11,12).